Got a question about plants, pests, soil, or bees? Drop by the Vallejo farmers market and visit the Master Gardeners table on the South East corner of Marin and Georgia Streets. We are there from 9 am until 2 pm every Saturday except when it rains (we don't have a tent). Master Gardeners Pat Chapman and Betsy Buxton are the mainstays of the table. Other frequent Master Gardeners are Trisha Rose, Darrell Schramm, Brenda Altman, Sally Thompson and others. Betsy brings all the flyers she can stuff into two rectangular plastic containers. Our whole 6' table is covered with information flyers and pamphlets mostly in English with a handful in Spanish. Betsy also brings a number of well dog-eared reference books. On one given July Saturday, the group of Betsy, Trish, Darrell and myself handled questions dealing with Powdery mildew on Sycamore leaves, Chocolate Spots on Fava Beans, Tomato plant leaf damage from Weed Control Sprayed on a nearby lawn and other fun gardening issues. It helps if the questioning gardeners either bring in a picture of the leaves or fruit or bugs in question. People drop by and might say “I have this long lasting problem and no one has been able to help me.” Which probably means I asked my neighbor or the postman and they don't know. Sometimes we don't know where the answers lie until we ask more questions from the puzzled gardener. Other times we all might have different ideas but it is surprising how with a brief discussion come up with some good answers. Of course, we always give out pertinent information from the flyers Betsy has provided and tell the gardener to do research on the ANR UC Davis website. We also encourage our newly made friends to report back to us with results good or bad. The questions are interesting and even though I might have an idea on the answers, but I listen to our group discussion and keep an open mind while we all are digging into the research books. Being a new Master Gardener I usually am hesitant in saying “it's definitely this,” I'll say, “it more than likely this,” or “try this and come back and give us feedback.” of course I say “check the website.” Sometimes the inquirer will forget a key clue and remember it when she gets home which would change the answer. The fun part is when a satisfied member of the public comes by to thank Betsy personally for home gardening advice. 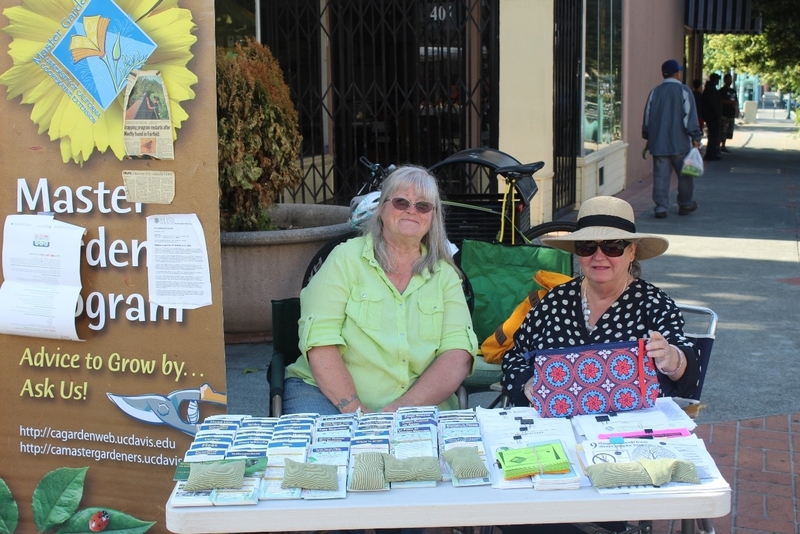 Whether you are a master gardener or just a novice gardener come by our table and share your gardening knowledge or tell us of your next gardening project. If you are interested in becoming a Master Gardener or just want to take upcoming classes or seminars we also can help you with that too.